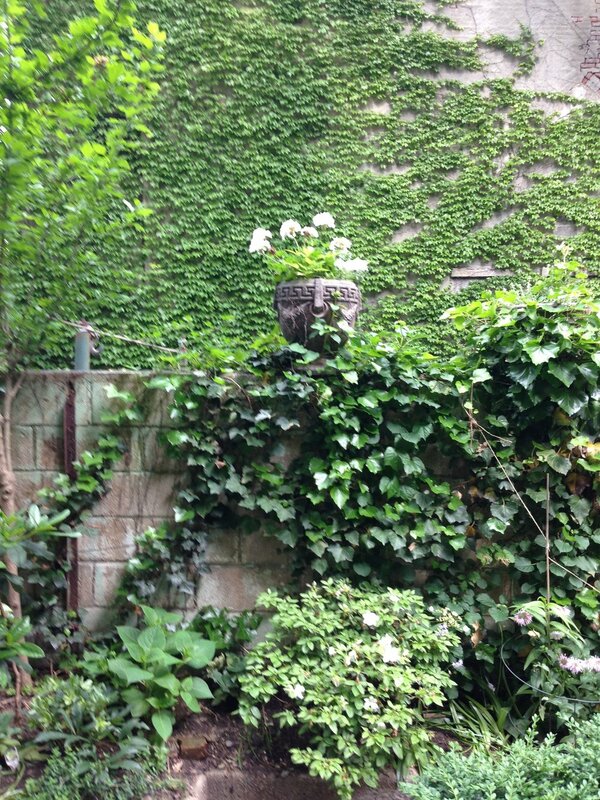 The ugly cinder block walls of this 17 x55' typical city garden are successfully masked with Ivy, climbing hydrangea and small flowering clematis to maximize planting area, add year round green and keep the center for living. The walls are topped with urns to exaggerate the verticality and add seasonal color. 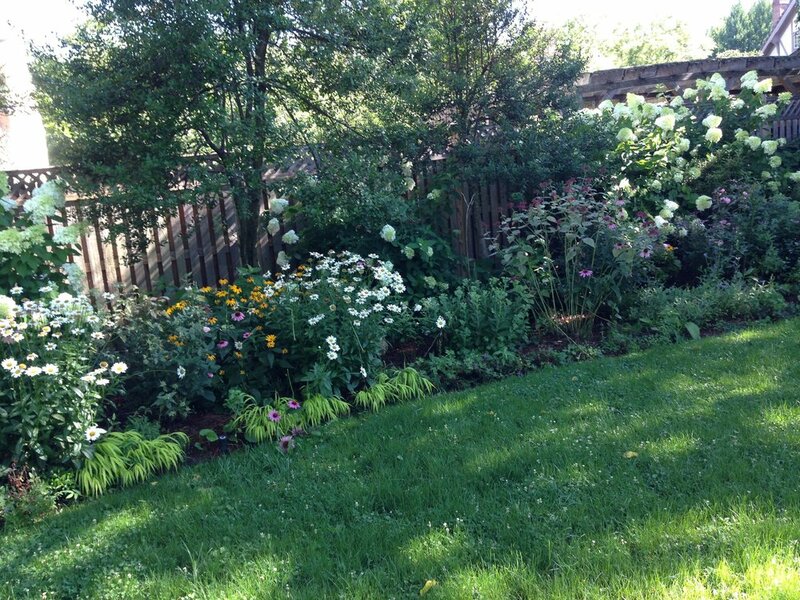 The narrow side beds are largely flowering evergreens with perennials for semi shade. A 70' Ash tree shades this garden so we mirrored the South end to reflect available light. Variegated evergreens, Helebores and acid shaded Heucheras and Coleus enliven the shade. 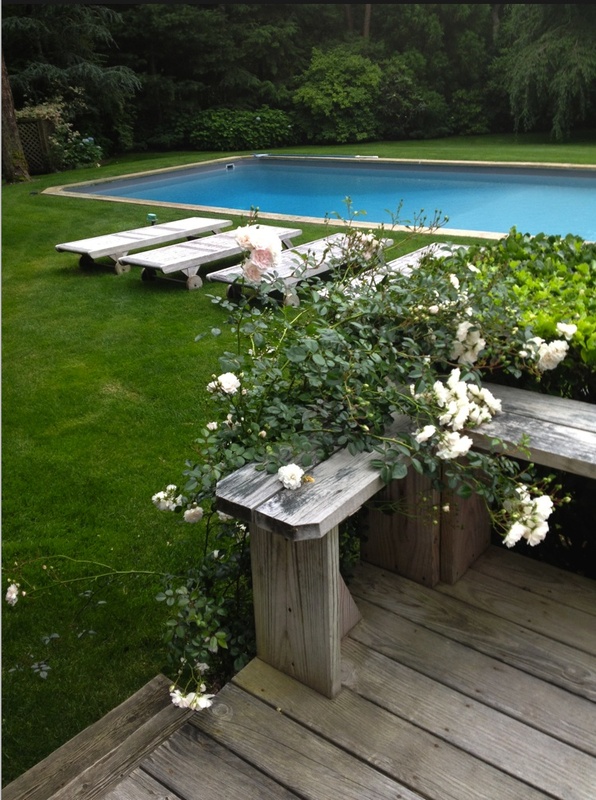 The addition of this rambling white rose married the deck area to the pool effectively. This was the ultimate in Sustainable Gardening as the 7 x 48' terrace in a classic limestone building is in shade, has courtyard/driveway views where drip irrigation would be problematic and little thrives. Nearly all is faux box matting wrapped to the balustrade wall to simulate hedging without taking up space, with faux box topiary balls to add privacy. To bring seasonal color and life into the space I added semi-circular planters full of roses, lilies and ivy on either side of the terrace entry. and small table planters that can be changed from Spring through Fall. 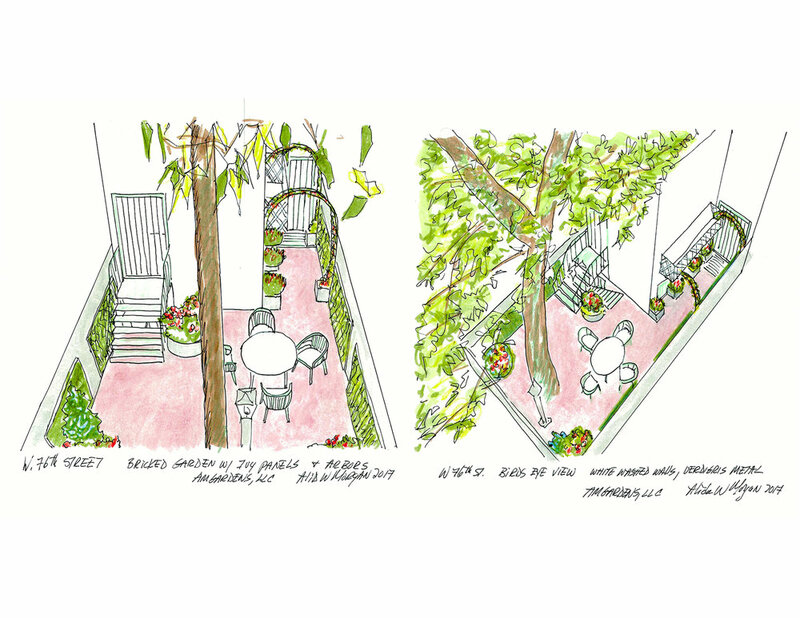 This is a double long site allowing the design to incorporate 3 distinct "rooms" for cooking, dining and lounging in 3 connected circular decks sitting in pea gravel to improve drainage and reduce flying insects. The Deck is raised 6" acting as a barrier for the planting sections and in-ground irrigation. The Asian feel cedar pergola has a retractable canvas ceiling. The plants are largely evergreen for winter interest with a few summer flowering perennials and all low maintenance. 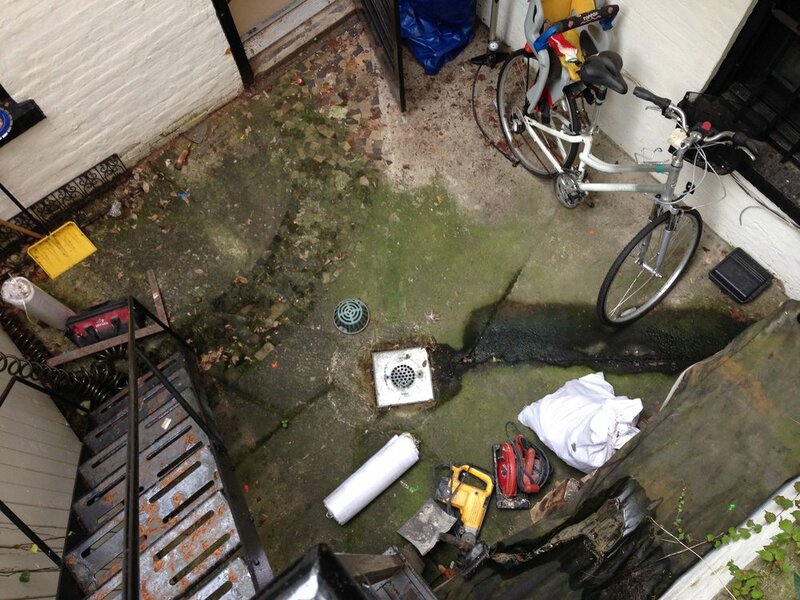 This waterlogged, insect ridden, moldy 10 x12' basement garden space was unuseable. Here it is after removing 1' of concrete and soils to improve drainage and replacing with white marble chips and an edging of shade loving evergreen plants. To add light we added mirrors. It is now an inviting spot with a bench and anew area for wood storage. Another view showing how now the entire 10 x12' space drains water from the roof. 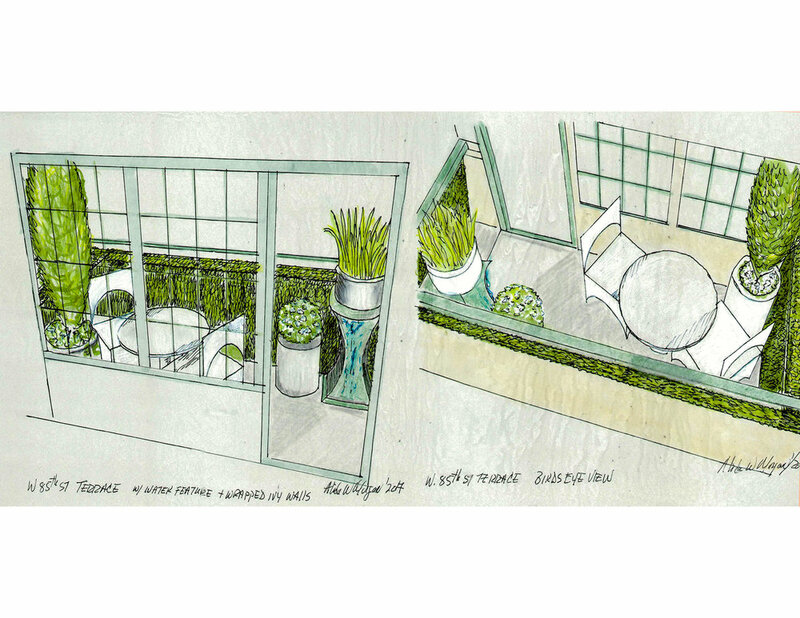 The 10x32'' deck area was the view from the living/dining areas and uninspired. 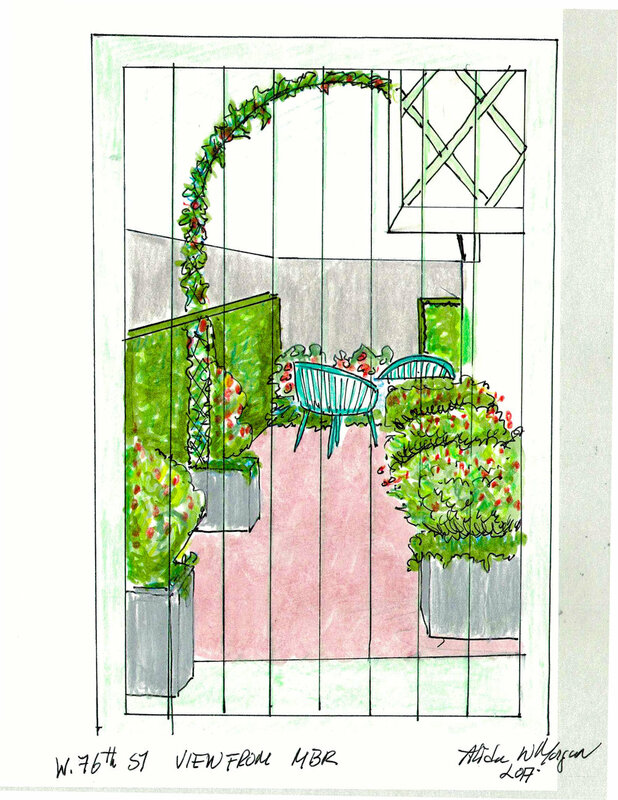 We suggested an aluminum I beam surround with arched mesh grids of ivy and small flowering clematis to make a vertical garden with year round appeal and privacy. The base was a narrow 15" wide planter that would also house herbs. The South end was to have an illuminated waterfall as a focal point and a side area trellised off in same for grilling. Several large planters by the kitchen door access to the garden were to have ivy trellising up the wall and lilies and roses for scent and seasonal color, leaving most of the area for seating and dining. 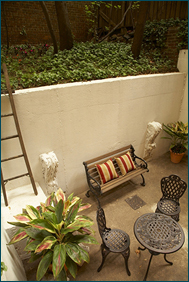 This tiny basement area garden in a 70's remodeled town house was derelict. To prep it for sale of the triplex, we white washed the walls, added a bench, bistro table and planters with Tropicals to be brought back into the flat in fall. 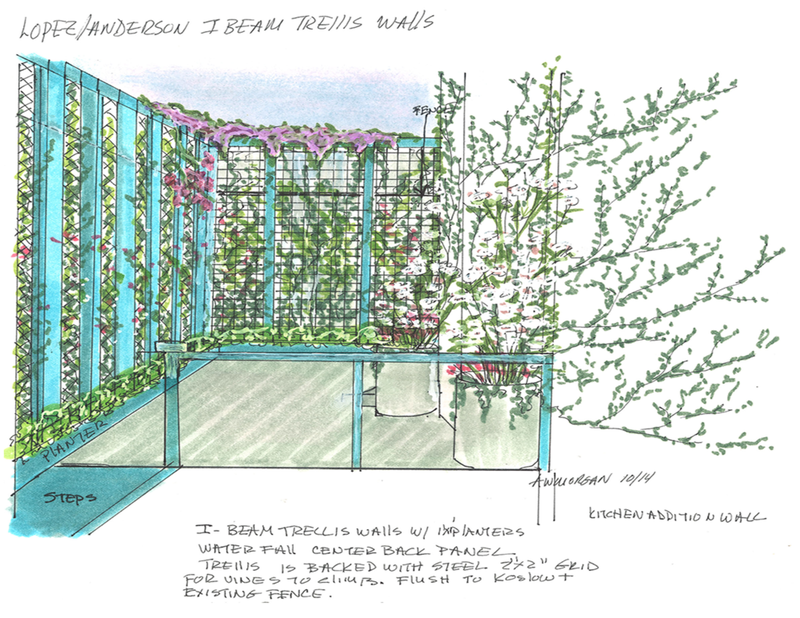 The wall planters were filled with bamboo for motion and privacy and the woodland level was thinned of saplings and studded with perennial ground cover and Impatiens for color. This balcony in a luxury rental is the first thing you see on entering. It has a view of the buildings across, little light and the deafening sound of air conditioners. To reflect available light we painted it off white, painted the metal bar, windows and doors sage green to tie in to a dominant book case in the living room, wrapped the balustrade walls with faux box mats to look like a hedge, and added a small sculptural water feature topped by a planter to drown out the air conditioners. 2 more planters, one with a conical topiary sky pencil wrapped in fairy lights and another with seasonal annuals for color and life finished the picture with the addition of a woven rattan bistro table and chairs. 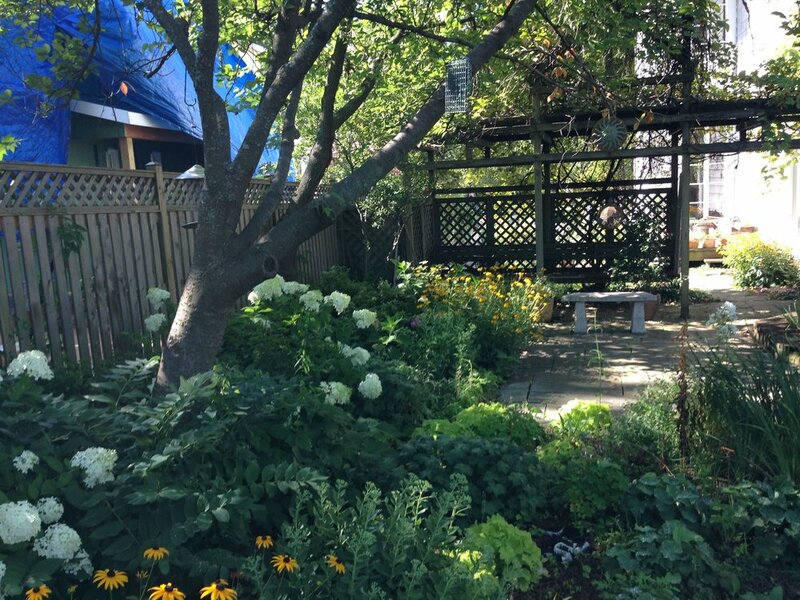 This small Park Slope garden needed a total makeover. The young couple wanted clean, modern lines with little budget. 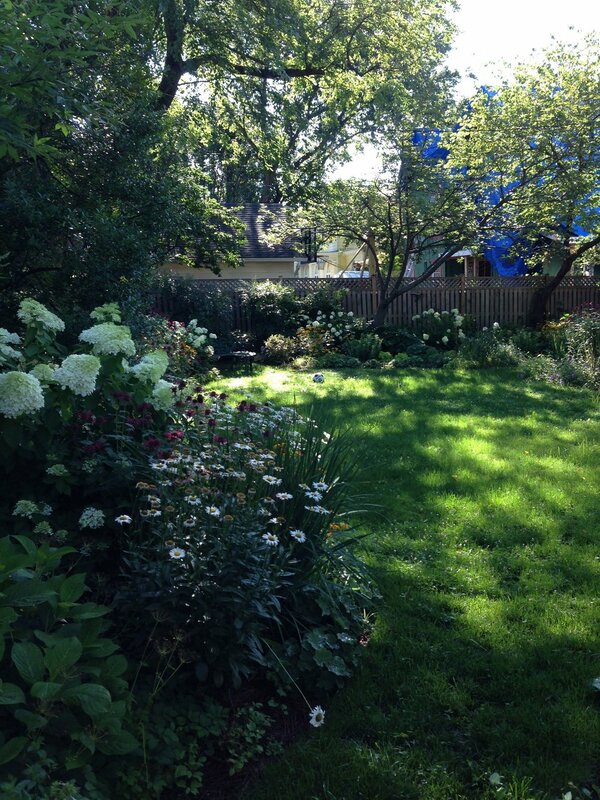 Here is that garden after the first phase of renovation. 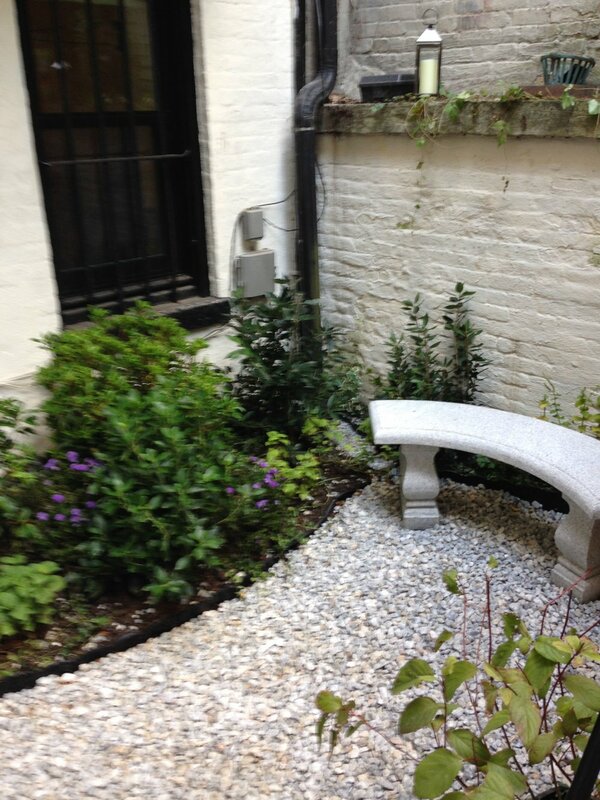 The crazy stone patio is gone, replaced with sand butted New York Bluestone. The railing have been turned into a feature with built in planters of evergreens and annuals, adding depth to a small space and colorful views from the MB. Marine hardware and steel cables keep it open, airy and modern. 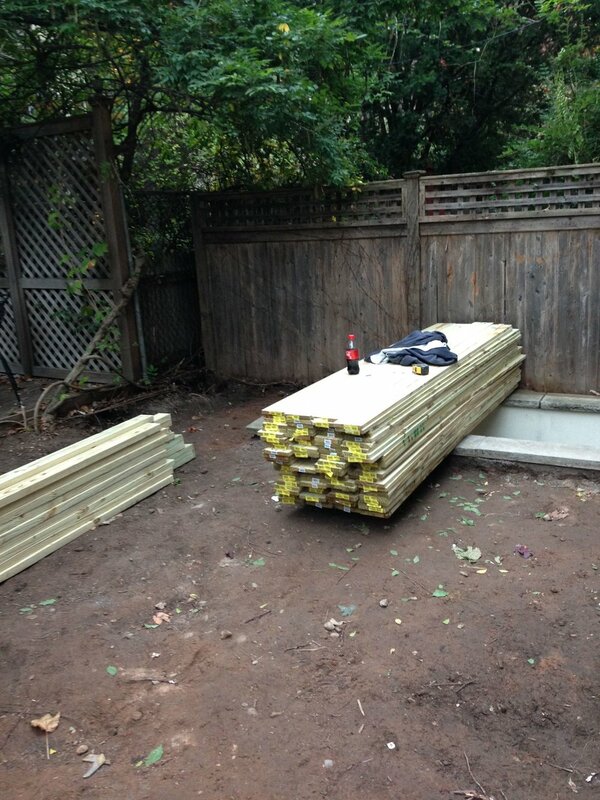 The fencing is a clean sweep of horizontal planks making it seem wider. 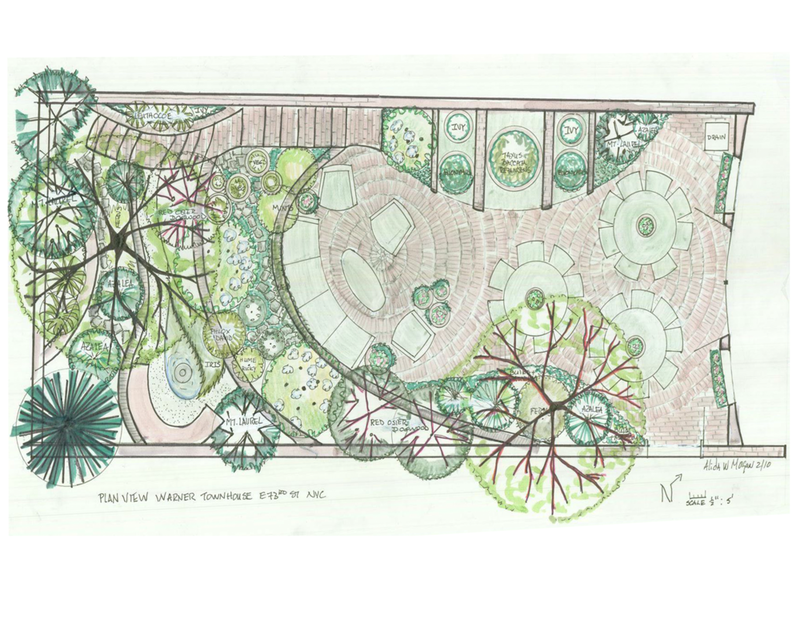 This drawing is of that Park Slope garden when all 3 phases are finished. 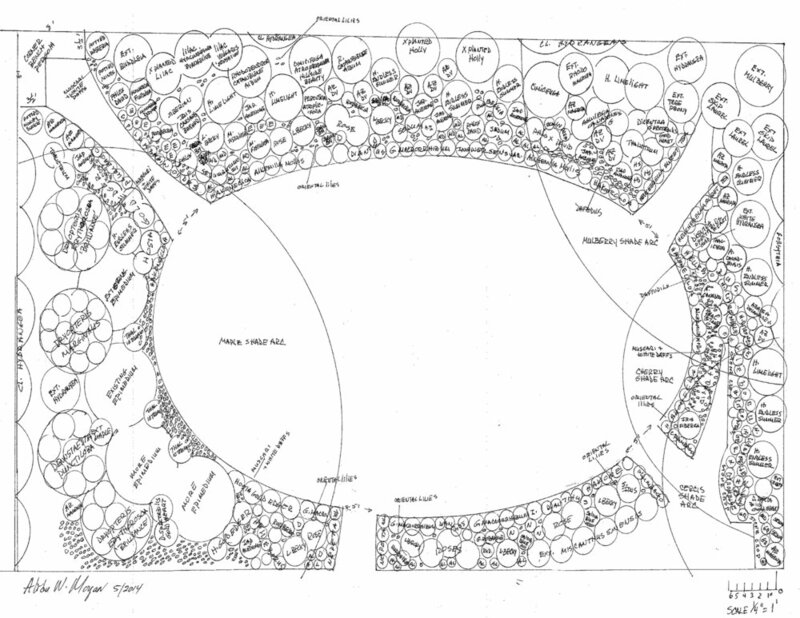 Taken from a detail of a planting plan, I think my card shoes the artist's approach to landscape and garden design. This 18' x 34' garden has an old brick floor and an enormous existing Ailanthus tree shading it. Everything except an unpainted new fence was derelict and this triplex, including the basement level, has no views and all doors and windows are barred. To reflect available light and brighten the space we white washed the building 2 stories, painted the fence driftwood gray, the iron bars, windows and deck landing Verdigris, covered the mechanicals with trellising painted to match the building and lined the 8 x 15' alley off the MB with stainless cube planters of Holly, added 2 arched arbors with same planters filled with Ivy and small flowering clematis and seasonal annuals for color to create an Allee entrance to the garden. 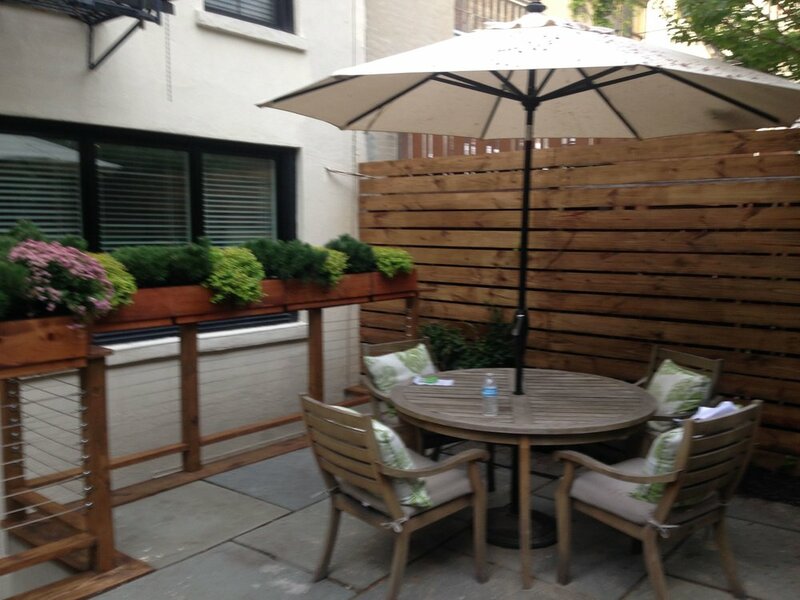 4'x8' Panels of faux ivy mats were placed on the fence to enliven the area and give winter interest. The tiny planting area was refreshed with Azaleas. 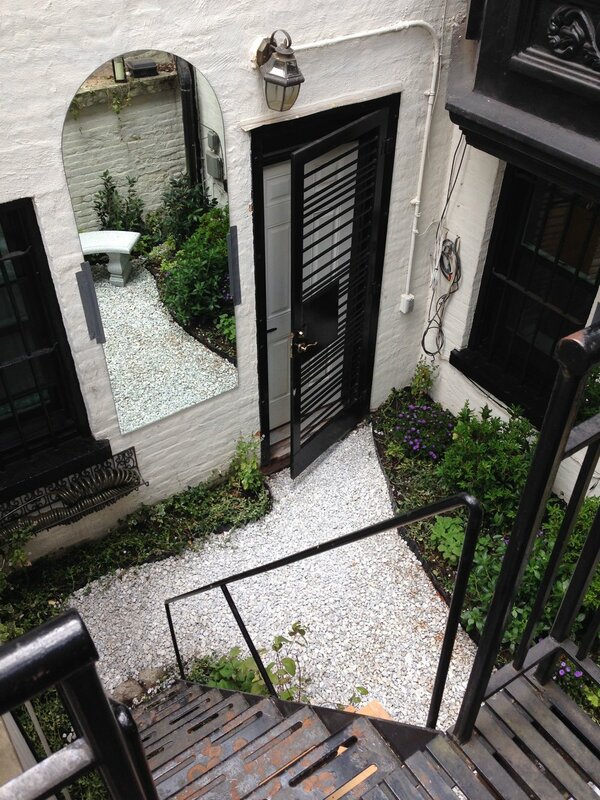 2 large circular stainless planters to soften the back wall facing the deck landing and to define the steps to the basement entry also got azaleas, ivy and added color. A round table and 4 chairs completed the picture. The view From the MB of this former alley is now a charming Allee inviting the owners to have their coffee out doors. 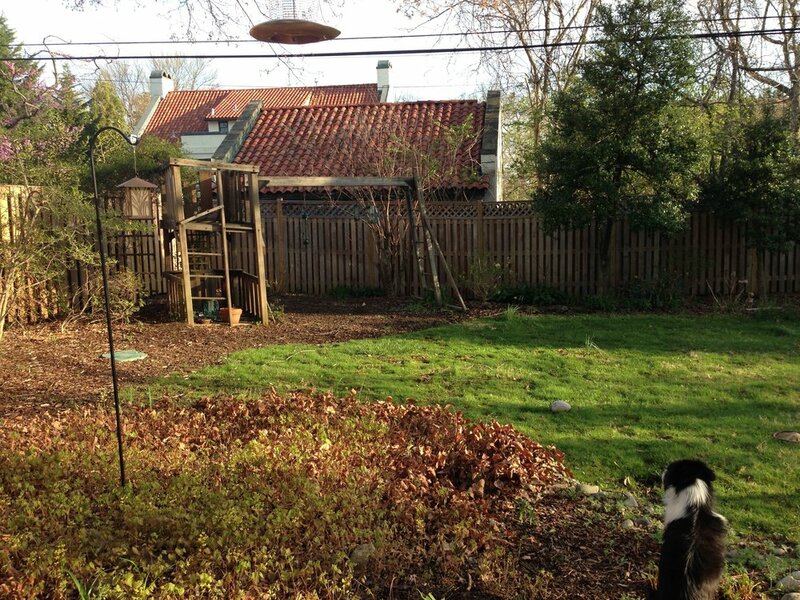 This large rectangular yard is dominated by a giant Maple and one of the oldest Mulberry trees in Chevy Chase. It hadn't been refreshed since the house was full of kids. 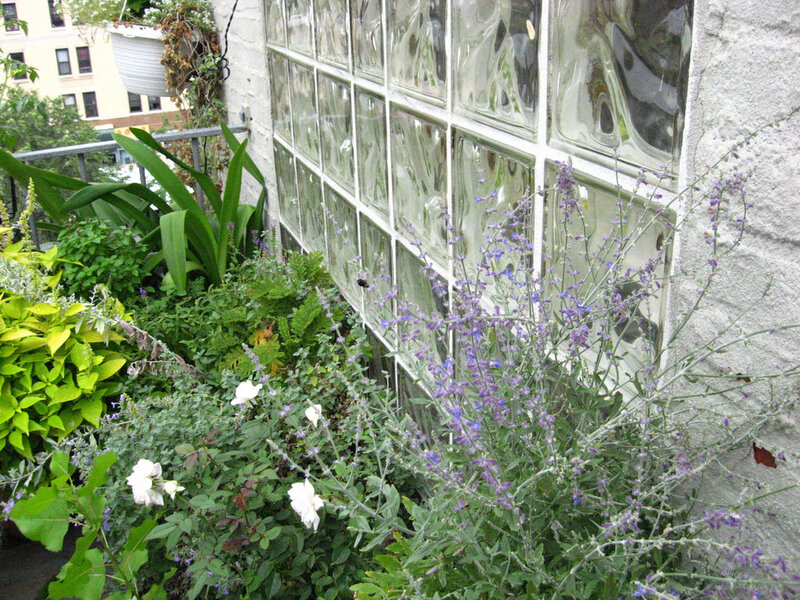 The owner wanted a sustainable garden geared to Butterflies and bees, a stretch with all the shade. 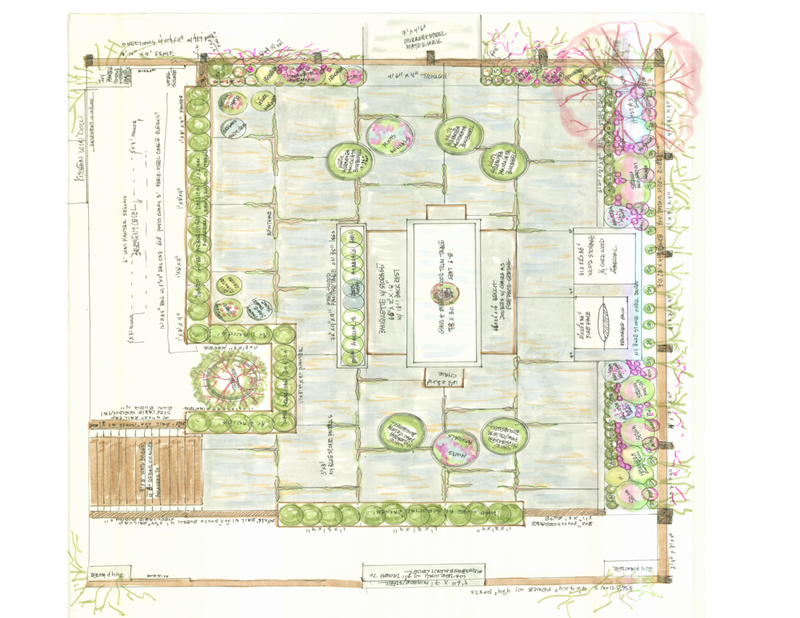 This planting plan illustrates how we stole more sunny areas for the bees and butterflies by carving out the lawn into an oval, loosing the swing set and replacing that with an arbor bench. Saving as much of the mature plants that were there we added hydrangeas, roses, and lots of smaller perennials and ground covers suited to either sun or shade for continual bloom from Spring through frost, edging all in Hakonechloa grass and Ingwersons gerarnium. The Shade areas under the Maple and Mulberry were given ferns, Aquilegia, Thalictrum, and Epimedium for flowers and motion for the insects. The existing grape arbor entrance refreshed with Hydrangeas , Heucheras and Iris. 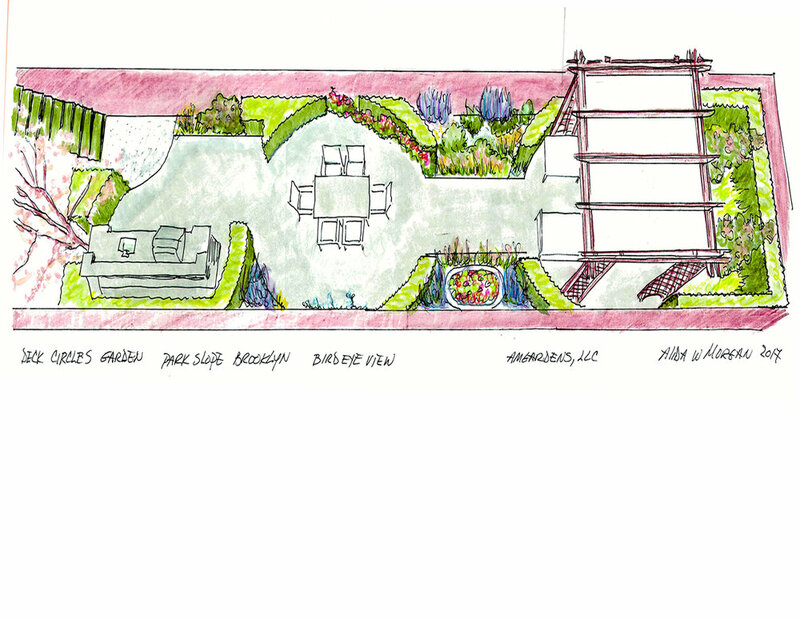 This project involved a 30' wide garden that had a 40' drop to a stream. There was a series of narrow stairs and decks going to a small flat area with a hot tub. 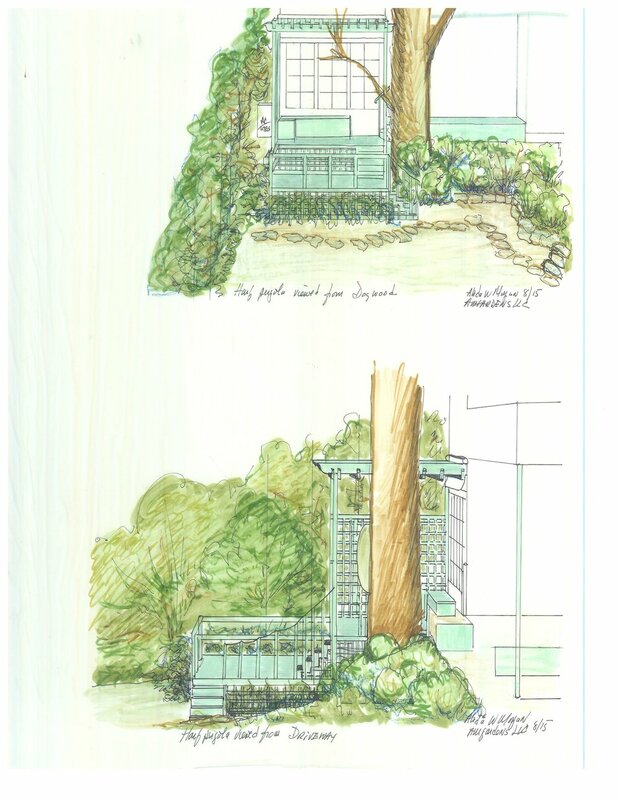 This design eliminated the hot tub and a deck by widening one into a a pergola sitting area with a moon hole cutout to the views and adding privacy from the neighbors, and a longer enclosed deck below leading to a partially terrace area of ferns and woodland plants leading to several stepped paths to different walking/viewing areas of indigenous woodland plants down to the stream. 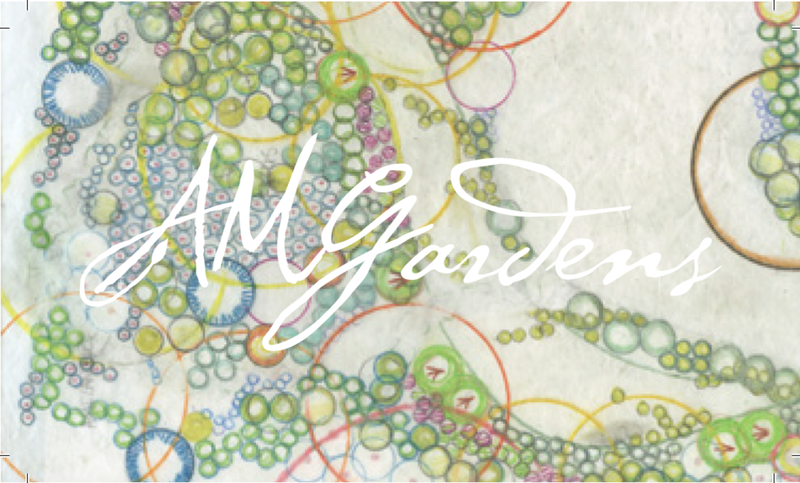 This design represents the clients love of formal French gardens. The rectangle is softened by a semi-circular back of the garden allowing a space for a fountain which adds a focal point. Instead of decking or a stone terrace, the whole is covered in pea gravel, the fence painted to look like limestone and softened by adding clipped espaliered Euonymus hedges with low clipped Danica arborvitae fronting that, and punctuated with conical topiary junipers. 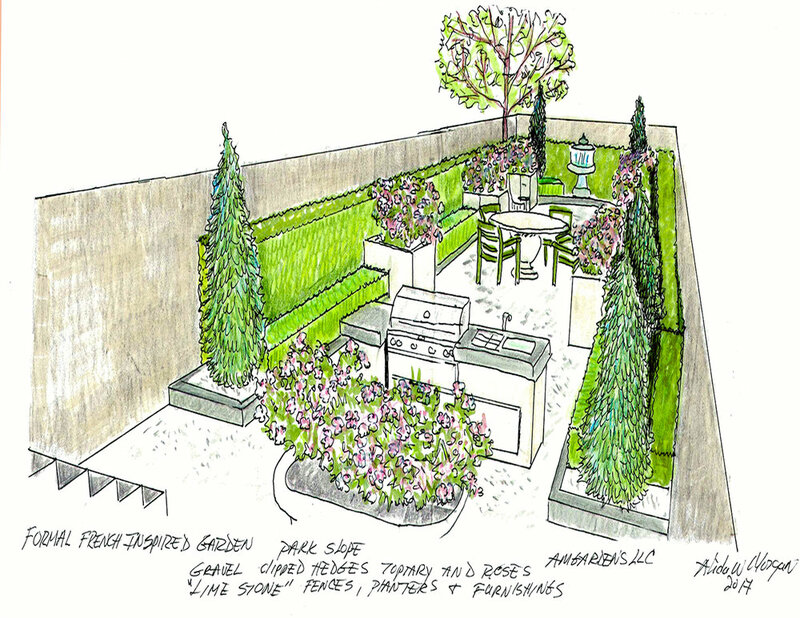 The planting areas are edged in slate with limestone planters of roses and ivy. An old claw foot tub that couldn't be removed is filled with same and acts as a screen for the adjacent garden apartments garden area. 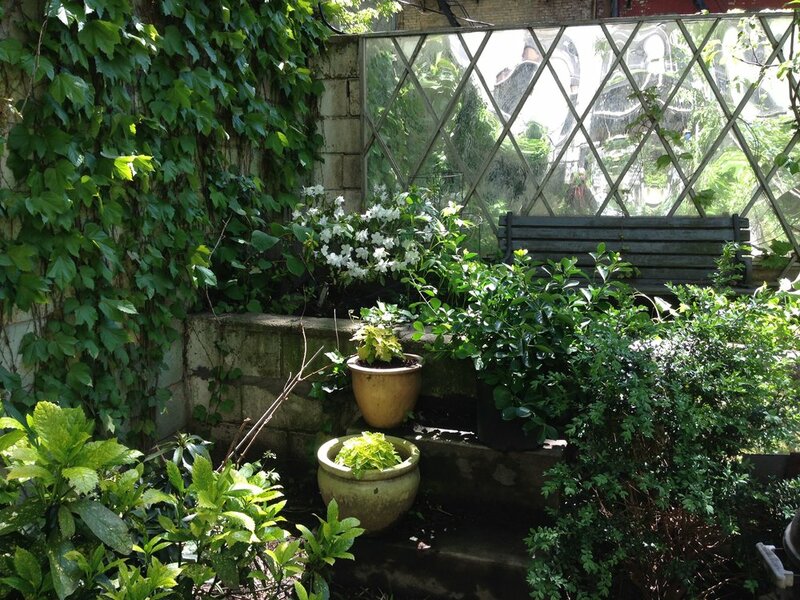 An unusual 22 x8' fire escape became a garden respite. No exits were blocked. Planters were bolted to rails. This version of an 18 x80' double long garden in Park Slope featured a slate toned New York Bluestone terrace with espaliered Euonymus hedging, with semi circular sections of evergreen and perennial planting to separate a kitchen area from the dining and pergola sitting areas. 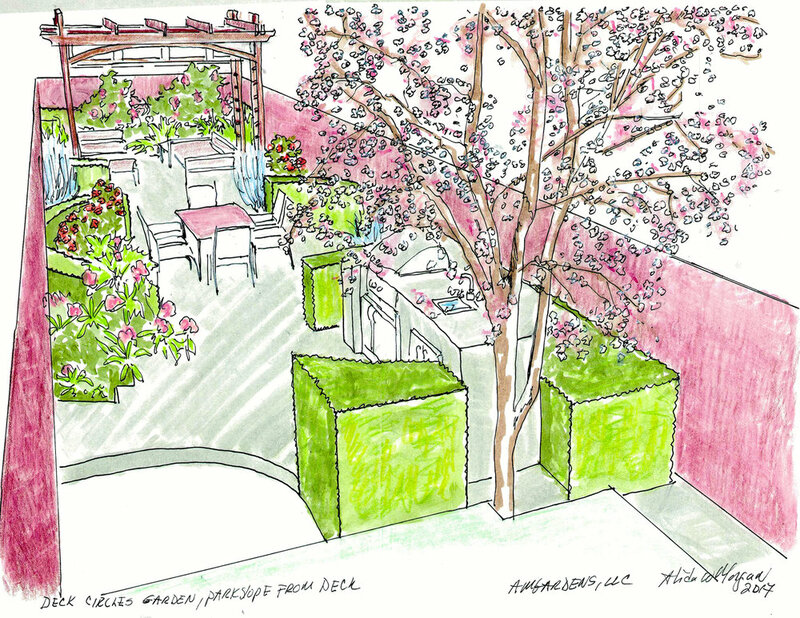 The Weeping cherry acted as a focal point from the living room and as a screen from the contiguous garden apartment's garden space. The plants are primarily evergreen for winter interest with flowering perennials for Spring, Summer and Fall color and are all low maintenance semi shade specimens as the existing maple casts so much shade. There is a small fountain in back of the pergola, surrounded by Rhododendron and ferns to add to the serenity. This town house garden has unfortunate views of neighboring infrastructure and loud air conditioning units. It had the luxury of an alley side entrance and French doors off the dining room for access. We paved it in a spiral pattern of bricks, and added 2 semi-circular levels of planting to screen the offensive mechanicals and mask the sound. We added a built in Cabinet like mini kitchen and storage and planted it all in Spring flowering trees, evergreens and ground covers. A custom semi-circular couch was built in as well.